Life's little details...: Creative Carte Blanche January Challenge! Creative Carte Blanche January Challenge! So happy to be here today on my own blog with an actual creation! my mind went blank and I felt like I had lost all of my mojo! It's starting to come back, whew! Starting to feel that creative itch again! This month's theme for Creative Carte Blanche was a little challenging for me as I live in Florida. We joke about winter and how it forgot us this year. Sure, we have had cold weather, but this year, it's been about THREE whole days. That's it...I LOVE cold weather...not the freezing kind, but the cool kind. Right now, we are running in the mid to upper 80's...hot and sticky! yuck. Send some colder weather my way please!!! hehehe. Okay, on to my 'flat' shaker card! 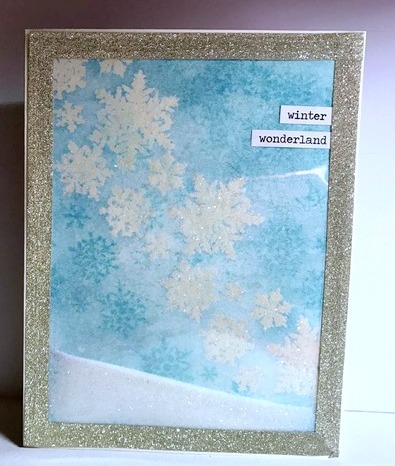 To start off with, I embossed the snowflake stamps with Iridescent Sparkle embossing powder. After I let that cook, I inked over that with Tumbled Glass Distress Ink. Then, stamped the snowflakes with Tumbled Glass all around the area that was embossed. After that, spray some Heidi Swapp Iridescent Color Shine. It adds that nice texture look from the reaction with the Distress Ink, but it also shimmers. Next, cut a piece of transparency a little smaller then your inked piece. Adhere the transparency to the front of your inked piece using scor-tape or ATG adhesive. (Don't seal the top just yet. Once you get the transparency adhered, pour some white or clear glitter into the pocket. Not to much, as you don't want to bulk out the card. Once that is done, take some pretty Washi Tape and create a border all the way around the card. This will also seal the top. As you can see below, the card is very flat. Kind of nice, so it won't add much postage if any. So...I hope you enjoyed my take on Baby, it's cold outside! I would love to go and play in snow for the day! A day would be just fine, as I am terrified to drive in the stuff, lol. we LOVE to see what you do! We will have more fun later this week! Love this sweetie, and love the image of you sitting in your studio getting your creative spark sparking. <3 WINK!! Gorgeous, Yvonne! Where is the butterfly?!?!? 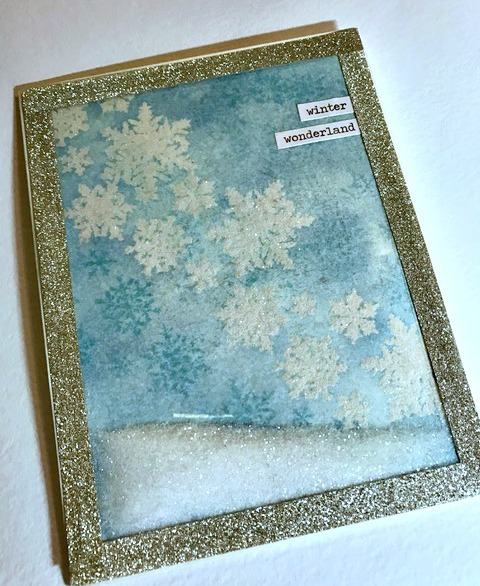 I love the way you've created this card and the free flowing snow! Very cool! I also love your sparkly washi tape! SO pretty! And your snowflakes are gorgeous against the blue wintery sky!